Kashi Cereal Bars - Are They Healthy? Cereal bars are a grab and go meal for many busy people. They make it easy to get out the door when time is running short. Joanne, a mother of a two year old, posted this question on Snack Girl's Facebook wall. 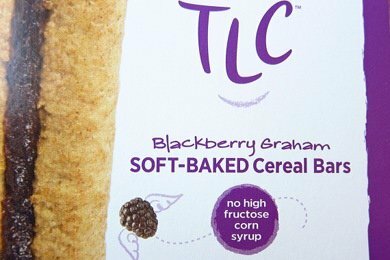 I love your site and would love to know what you think of Kashi's TLC cereal bars. My 2 year old loves them and often requests them for breakfast. She doesn't like breakfast usually but will eat these. I worry they are not as healthy as they seem. I hear you, Joanne. Every time I pick up a product from Kashi, I don't know if I am getting something crappy like Kashi Go Lean Crisp! or a healthy choice like Heart To Heart. So, I took a look and taste of the Kashi TLC Soft-Baked Cereal Bars and they taste like a squishy oatmeal cookie. Let me just preface by saying I NEVER want to make a parent feel bad about what they feed their kid. My four year old ate pumpkin pie yesterday for breakfast, and I'm not apologizing to anyone. The problem with these cereal bars is (you guessed it) sugar. Personally, for breakfast, I would like this to match the nutritional components of a healthy cereal which I have outlined here: Candy or Breakfast? Evaluate Your Cereal. So, that would mean that we would want the first ingredient to be whole grain, 5 grams of sugar or less per serving and four grams of fiber. So, the first ingredient is the "blackberry filling", there are 9 grams of sugar, and three grams of fiber. Which reflects that this is a pretty healthy cookie! But, not something I would want to serve at breakfast EVERY day (maybe just twice a week?). My kids only ate white food when they were two. ARGH. Please share any other kid-friendly breakfast options for Joanne. How about an easy french toast? Soak a piece of whole wheat bread in some egg white (I love the kind you can pour from a container), sprinkle on cinnamon sugar, lightly spray a fry pan with canola oil and cook till brown on both sides. Promise it only takes 5 minutes or so and it's kid friendly and delicious! Your daughter could also help cook it. agreed on the french toast - my guy loved/loves it - also you can make a mess of pancakes or waffles on the weekend and those will last most of the week - and there are always scrambled eggs for a blast of protein. Thanks so much for looking at these bars! I think I already knew what you were going to say. LOL. I would love some new quick ideas. We usually have less than an hour to get everyone out the door. My daughter does get a 9 AM snack at daycare that includes healthy good breakfast foods, so I don't feel so bad, but I prefer she not have so much sugar. Thanks again! I found a great Breakfast Cookie recipe from Ellie Krieger on the Food Network website. I made these into bar-shapes so they'd fit in a snack bag and packaged and froze a bunch of them one weekend. I made a couple of batched with different dried fruits and nuts until I found one that my kids liked (blueberries and pecans were a fave). (I chopped the nuts up very fine so they were easy to eat for my 2yo son.) They're great and thaw in no time. I haven't tried adding some jam in the center to make it a true knockoff of the nutrigrain bars, though, yet. That reminds me I need to make another batch! Place rack in center of oven and preheat oven to 350 degrees F. Whisk together flours, baking soda, cinnamon, nutmeg and salt in a medium-sized bowl. Combine butter, oil and sugars in the bowl of a stand mixer and mix on high speed, scraping down sides if necessary, until sugars have dissolved and mixture is light in color, about 1 minute. Add egg, carrot puree and vanilla and beat an additional 30 seconds. Add flour mixture and beat an additional 30 seconds. Add oats, flakes, raisins and walnuts and mix over low speed just until incorporated. Dough will be slightly sticky and less cohesive than traditional cookie dough. Line a large cookie sheet with parchment paper. Using between 3 to 4 tablespoons of batter, form a ball and place on cookie sheet. Repeat with remaining batter, leaving about 3 inches between cookies. Wet hands and use palm of hand to flatten cookies until about 1/4-inch thick. Bake for 12 minutes, until cookies are fragrant but still soft. Let cookies cool slightly, then transfer to a wire rack to cool completely. But if you make waffles or pancakes you are (probably) adding syrup...which is a lot more than 9 grams of sugar per serving. My son likes the Kashi Autumn Wheat cereal (he is 2) which is only 7 grams of sugar per serving. He also likes plain oatmeal with blueberries and a drizzle of honey. we were planning a camp out with other families and had a family friend's son that was allergic to annatto....I was attempting to buy some shelf stable food and was unable to buy any kashi products as they all had annatto.....just a word of warning to those with dye allergies....we have a standard breakfast for our four year old of sprouted whole grain bread with cheese melted onto it.....we have never been a cereal family, just not our thing.....he also loves homemade pinto beans kind of mashed onto homemade tortillas....we make them in large batches and freeze them....then just reheat in the oven! What about homemade granola...it's a super easy sunday project, it's a whole lot healthier (and cheaper) than the sugary store-bought varieties and you can easily turn it into breakfast bars that will save well for a week (use apple butter or honey to hold it all together). Just a thought - the french toast idea also sounds like a winner to me! I chop up apples, bananas, strawberries, or whatever fruit I have on hand and put a dash or 2 of cinnamon in my pancakes. They are amazing and you don't need syrup - it actually ruins them! Eating these is eating a cookie for breakfast. The Health Food industry has exploded in the last few years - everyone is getting on the bandwagon - even Wally World, you need to start being more diligent on the so-called healthy foods available. Stuff like this is convenience food - buy fresh not processed - making Granola is easy. The above recipe for Breakfast Cookies is good accept I would dump the white sugar and use honey instead. Seriously, thanks for being real. Statements like "My four year old ate pumpkin pie for breakfast" make me want to read more of your reviews because I know you are operating in the REAL WORLD with the rest of us! :) Still trying to always be better & healthier, but doing it in the real world :) Keep it up. Thanks. Most of these comments are missing the point. This product is about convenience but it comes with massive amounts of California style green wash and food mythos. We learn that Sara and Mel are saving the planet with Non-GMO (every ingredient has been modified by humans over time) and exotic sounding ingredients growing sustainable "superfoods" on their educational farm. Hogwash. You would do just as well eating 1/2 a slice Sara Lee wheat toast with some Schmuckers grape jam. Bon apetit. After reading these comments I shall go back to eating my oatmeal with cranberries and nuts. I have been eating the Kashi honey almond and flax bar but since it has gotten smaller and seems like the flavor is off I think I will go back to my oats.